The so-called Edict of Milan (aka The Edict of Tolerance and Edict of Constantine) was issued in the names of Constantine the Great (the emperor of the Eastern Roman Empire) and Licinius (emperor of the West) in 313. It guaranteed religious tolerance and, thus, opened the way for numerous Christian churches to be built in the centuries to follow, churches that are now termed paleo-Christian. The church of San Giovanni Maggiore is one of four such prominent early Christian basilicas in Naples. (The others are the churches of San Giorgio Maggiore, the Santi Apostoli, and S. Maria Maggiore. (Although S. M. Maggiore claims to be the oldest, that claim cannot be resolved with any certainty.) 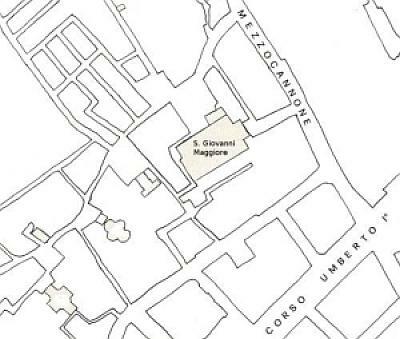 At least the earliest version of San Giovanni Maggiore is from 324 on what was the site of an earlier Roman temple. Legend has it that the Constantine, himself, personally ordered the construction of the church in thanks for his daughter's having escaped from a shipwreck. Even if that is apocryphal, the church is very, very old and is an important part of the early Christian fabric of the city. The other three basilicas (above) are accessible, but San Giovanni Maggiore is closed, dilapidated and virtually impossible to find. Even if you find it, it is difficult to appreciate historically since it has been overbuilt with centuries of other construction and half-construction. It is, today, in no real sense, at all recognizable as the important historical monument that it is. In the centuries before the building of the Naples Duomo, San Giovanni Maggiore served somewhat in that capacity; it is where, for example, Robert of Anjou was installed as Duke of Calabria in 1297. The first known rebuilding of S. Giovanni Maggiore was carried out in the late 500s. The speculation is that, since that was still in the times of Byzantine Naples under Belisarius, the church must have taken on a distinct eastern flavor in terms of architecture and interior ornamentation, most of which was then covered over by later Norman and then Angevin builders. The last major rebuilding of the church was under the sculptor and architect, Dionisio Lazzari in 1685. It was a major Baroque rebuilding that did not leave much of the original structure intact. The church survived into the 20th century as a house of worship, but has now been closed for decades to the public although parts of the various outer surfaces have been restored. Within San Giovanni Maggiore, there are still paleo-Christian fragments in the semi-circular apse (photo, above). The main altar was done by Domenico Antonio Vaccaro in 1743. The interior still holds significant works art, but there is also a long list of works that have simply disappeared over the years. update Nov. 2014 - The Italian Touring Club (TCI) has announced that this church is one of the four in Naples, typically closed to visitors in the past, that is now regularly open (!) to visitors as a result of the TCI's cultural heritage initiative called Aperti per voi (open for you). The program enlists volunteers throughout Italy to act as guides and, in general, help with the necessary work in keeping such sites open. In Italy, the volunteer organization has sponsored some 60 such cultural sites. See this Miscellany link for the others.